Well hello! Would you care for a jelly baby? Hello everyone. 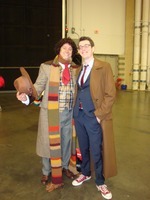 I'm the Doctor.... well, not really. 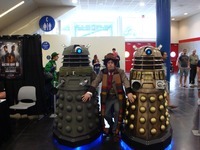 I cosplay a decent Four though. I have been a fan of the show for over 30 years now. I used to stay up late on Saturday nights and watch the old Tom Bakers and Peter Davisons on PBS. I currently live in Cypress, Texas (Houston area). My nephew and I love, love, love to cosplay at conventions. 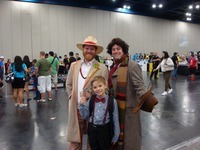 We recently attended both the Dallas Comic Con and the Houston Comic-Palooza. It was a blast. Look forward to chatting with you all!!! Amazing stuff ScarvesAreCool, you have just the right face for Tom!